Melbourne loves Horse Racing and Harness Racing (trots) with tracks at Caulfield, Moonee Valley, Flemington, Melton and many country Victoria tracks. A site for thoroughbred horse racing in Australian and New Zealand it is great ratings for long shot winners, latemail and their now famous Auzbets. .. The amazing Australian thoroughbred racehorse Black Caviar, foaled in Melbourne, undefeated in 25 races was retired on the 17th April 2013.. Black Caviar's success record of consecutive 25 wins (no ..
Caulfield Cup Day Saturday, 19 October 2019 Gates open approximately 1 hour before Race 1 Caulfield Racecourse, Station Street, Caulfield East Known as the world's richest turf handicap over 24 ..
Each year the Caulfield Cup Carnival delivers one of the most highly anticipated events on the Australian sporting and social calendar where expert punters and the newly initiated gather for world cla ..
National Sports Museum at the Melbourne Cricket Ground (MCG) have launched a new gallery to celebrate the rich history of Australian thoroughbred racing. Champions marks the completion of the third ..
Country racing plays a prominent role in the heart and soul of Victoria. When you hear the thundering hoofs of the thoroughbred meet the fresh country turf, racing truly comes alive. Country Racing ..
Cyberhorse - Everything to do With Horses! 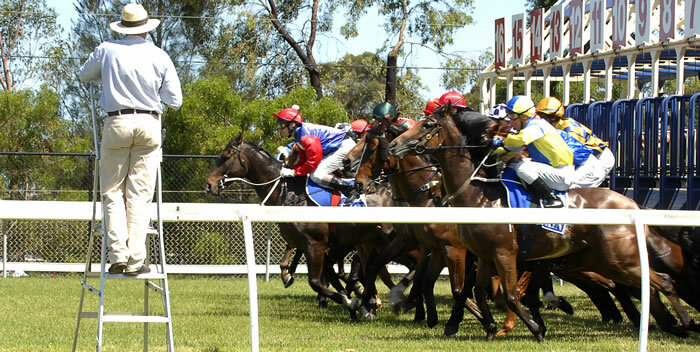 The Virtual FormGuide is an Internet delivered range of information for Australian horse racing fans. Free services for TVF Members for all Australian ..
Harness Racing Victoria is a statutory body for which the Victorian Minister for Racing is responsible. Our mission is 'to develop a vibrant Harness Racing industry that promotes participation, int ..
Popular Victorian and Australian Horse Racing Links... Racing Victoria http://www.racingvictoria.net.au Racing Clubs - Metropolitan Moonee Valley Racing Club http://www.mvrc.net.au Victoria .. In Australia, every horse has its birthday on the first day of August each year.. Thursday 1st August 2019 All thoroughbreds have the same birthday so that their ages can be standardized for c ..
Melbourne Racing Club is the home of Caulfield Racecourse and the Caulfield Cup, Ladbrokes Park (Sandown) and Mornington Racecourse. The Melbourne Racing Club conducts race meetings annually across ..
Bravery, dedication, passion... these qualities are key in the world of racing, where every time a jockey climbs onto the back of a horse they are putting their life on the line in order to compete. .. RACING Check leading sires, broodmare sire and 2YO sire lists. Leading Sires. Look at recent stakes race in date order or check sires of stakes performers. Stakes Results Stakes Sires SALES Results ..
Racing.com Park at Tynong is the new home of the Pakenham Racing Club. Racing.com and Pakenham Racing Club (PRC) are proud to confirm that the new Pakenham Racecourse will be known as Racing.com Pa ..
Australia's most famous racehorse Foaled in New Zealand in 1926 by Night Raid out of Entreaty, Phar Lap grew to 17 hands and over his career won more than 65,000 pounds in prize money and won 37 of .. Racing Victoria Limited's vision is 'to enhance the Victorian thoroughbred racing industry's position as a leading world-class sporting industry, delivering integrity, quality and entertainment'. ..
Each major race day throughout the Spring Racing Carnival has a flower dedicated to the day, so avoid a floral faux pas and be sure to wear the right flower on the day. Flower of the Day Dress you ..
Tabcorp Park is Victoria's newest and biggest sporting and community hub located in Melton. Tabcorp Park is a unique sporting and community hub with a range of entertainment facilities operating s .. The Victoria Racing Club (VRC) was formed in 1864 and has become one of the most prominent members club's in Australia. Monday to Friday: 9am - 5pm Flemington racedays: 9am - 11am Flemington ..
Werribee Racecourse is a 25 minute / 32 kilometre leisurely drive from Melbourne via the Princes Highway. Werribee Race Course A wide and well-grassed track of an unusual design, this track has ..